It’s the age of artificial intelligence, and 85-year-old Marjorie – a jumble of disparate, fading memories – has a handsome new companion who’s programmed to feed the story of her life back to her. What would we remember, and what would we forget, if given the chance? This richly spare, wondrous new play explores the mysteries of human identity and the limits – if any – of what technology can replace. See special events & ticket deals below! 4 standard seats for $100. 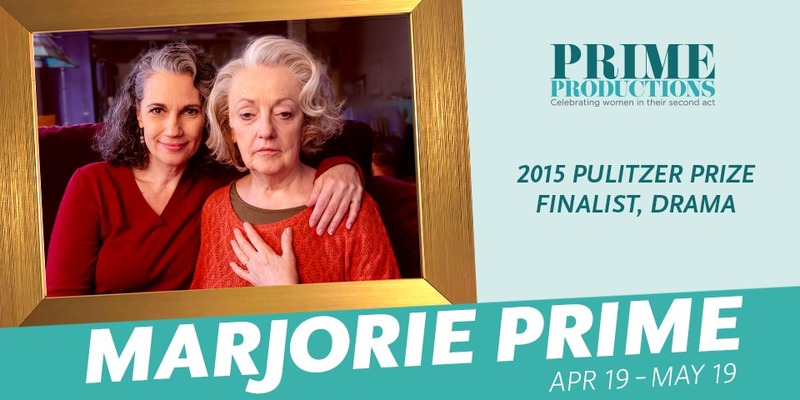 Valid for previews April 19, 20, 24, 25. Use code FAN. Available at the Ticket Office window day of performance only. 99¢ tickets go on sale at 6:30pm (7:30pm showtime). Limit 4 per person. $10 off standard or premium tickets for Sunday, May 12. Purchased by May 10. Subject to availability. Use code MOM. $10 off standard or premium tickets for May 10 and May 17. Purchase by May 8. Use code FNO. Professor Maria Gini, robotics and artificial intelligence specialist at the U of M Department of Computer Science and Engineering. How can artificial intelligence enrich lives — from Autism to Alzheimer’s? Moderated by Laurie Fitz of Connections Radio. Marysue Moses of Ebenezer Memory Care. What are creative and clinical ways of treating dementia and Alzheimer’s Disease? How do we counsel family and friends and caregivers? MWP Conversations, using the power of women to shift narratives and effect change. Guest panel focusing on the topic of the Minnesota Women’s Press April issue: Endings. Order tickets online any time!